Millenia Elementary School in Orange County debuted WalkSafe curriculum on September 24th. 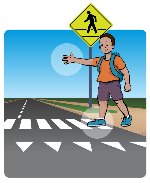 This school program focuses on pedestrian safety for Elementary-age children. 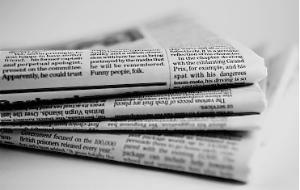 Look for the program to expand throughout Orange County schools in the near future! 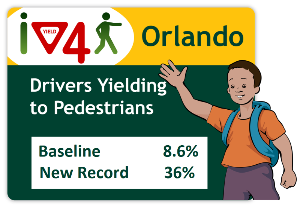 Many City of Orlando Public Works vehicles are sporting new iYield4Peds bumper stickers. After a city training meeting this past week, city traffic engineers requested bumper stickers for their fleet of vehicles. If you spot a city truck with the sticker as you are out and about, please thank them for participating in this safety initiative. In cities and towns where people are seen walking, there is a sense that they are safe and friendly places to live and visit. The social and personal interaction that occurs when people walk improves our quality of life. Interaction with our neighbors strengthens relationships and contributes to our sense of identity and place. Orlando has a new arts initative, Walk On By, designed to become a coordinated series of chance encounters with art. On Sept. 5th at 8:30 am, several outdoor spots in the downtown area of Mills Avenue became host to paintings, sculpture, music, dance and conceptual art. A contemporary outdoor art museum with no fixed location is the dream of artist and arts administrator Pat Greene. For more information, and to follow the progress of future encounters, go to thecorridorproject.com. Several Orange County schools plan to participate in International Walk to School Day (Oct. 3) and/or Walk N’ Roll (Oct. 10th). Lake Whitney Elementary is holding a Health & Safety Fair (Oct. 13th). We would like to get volunteers (at least 2 per event) to hold iYield4PEDs signs and hand out fliers. If you can volunteer any of these mornings, please contact Marianne at 407-412-5980, or by email, [email protected]. 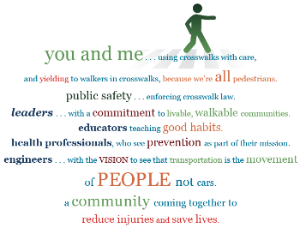 And just to get you inspired, share this Ped Safety Walk video with your friends and family. Ah, the joys of 80s music! Sat. Oct. 6, 2012, 8 am: Winter Park Mayors’ Sole Challenge at the Stage in Central Park at 236 N. Park Avenue, Winter Park, FL 32789. For details please call 407-644-2300 ext.241. Sat. Oct. 20, 2012, 9 am to noon: 12th Annual Wiggle Waggle Walk to benefit SPCA of Central Florida. Billed as the biggest and best pet walk in Seminole County, the fundraising event will be held at Cranes Roost Park at Uptown Altamonte. For details about fundraising or the day’s events check the Seminole County SPCA website. Sat. Oct. 20, 2012, 9 am: Making Strides Against Breast Cancer 5K Walk of Metro Orlando, at Lake Eola Park. Sign up here. Thurs. Oct. 25, 5:45 pm: Harvest Hustle 5K Run/Walk and food drive, to end childhhood hunger, at Baldwin Park. Register online.